Based in Richardson, TX, NCY Development & Construction is owned and managed by Nathan Young. NCY Development & Construction is a full-service residential & general contractor committed to serving our clients with exceptional customer service throughout the entire process: From pre-production design, through construction, and through and beyond the warranty period to homeowner maintenance. After 15 years in construction in the Dallas/Ft. Worth area, and overseeing the construction of over 2500 homes, town-homes, and condominiums, Nathan Young founded NCY Development & Construction with one thing in mind, The Customer Experience. "I have seen it done well, and I have seen it done poorly. Achieving high customer satisfaction in any industry is all about communication first, good planning and execution second, then follow-up." The construction process is hard on a lot of people. It doesn't always have to be. "Hi Nathan - I think about you every time I walk into my kitchen. I'm so thankful I found you in my mailbox, and I did! I love everything you did and working with you was great fun." 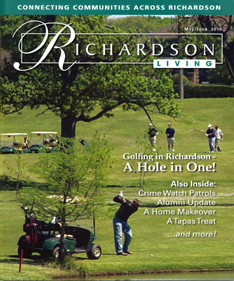 NCY Development featured in Richardson Living Magazine! Sign up today to take advantage of additional features such as creating your own gallery portfolio! What can NCY Development & Construction do for you? View our services page for details. Here at NCY we promote green living and we can help you get there. Find out how! See what our customers have to say about our work at NCY Development & Construction.